The Pez candy dispensers we all love to collect started from an idea an ingenious Austrian entrepreneur had back in 1927. The Haas Candy Company was already making foodstuff products when its owner, Eduard Haas III, who had a personal dislike for smoking, thought adults might want an alternative to smoking. Mr Haas speculated adults would be delighted in chewing a refreshing mint candy as a substitute. Peppermint oil was quite expensive in those days, and to have it available in a nice candy tablet form was a novelty at the time and became very popular. In fact the trademark name “PEZ” was derived by Mr. Haas as an abbreviation from the German word for peppermint: pfefferminz. The sale of the Pez peppermint candy was so successful that later other flavors were added to create an entire line of candies. This finally led, in 1948, to the idea of having a convenient pocket dispenser for them. 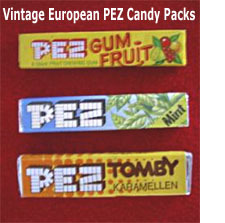 Since the candy was primarily marketed for adults in Europe during the early years of Pez, some unique flavors were produced. Anise (a strong black licorice flavor), chlorophyll, chocolate, cinnamon, coffee, eucalyptus-menthol, flower, and salmiak (a very pungent licorice) flavored Pez candy were all once available. In 1953 the company had the idea of increasing candy sales by also targeting children and hence more fruity flavors such as cherry, lemon, lime, orange, and strawberry appeared. Also in 1953, Haas opened a branch of the company in the United States which initially imported and sold four flavors of candy (cherry, Chlorophyll mint, lemon, and peppermint). These four flavors came with a plain head pocket dispenser. Several years thereafter to further increase the candy’s appeal to children, the company decided to place familiar character heads on top of the dispenser and make it look like a toy. A Pez candy production plant was built in the U.S. in 1974, but, possibly due to American food production standards, some of the ingredients used in making U.S. Pez candy were changed. Thus, a difference in taste occurred between the same flavors made here in the United States and those made in Europe. This was particularly true of the U.S. made wild cherry Pez candy, which some people felt tasted like cough syrup. In 1985 the U.S. cherry flavor was discontinued and replaced with grape. 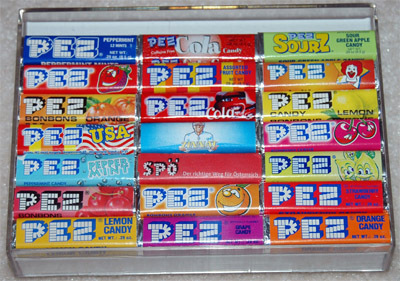 No new Pez candy flavors appeared in the U.S. until 1995 when peppermint Pez was re-introduced to the American market. In 1999 cola flavored Pez was released to the world market, except in the states. In 2002 the new Pez Sourz flavors (sour blue raspberry, sour green apple, sour watermelon, and sour pineapple) were released. Then in 2004 the cola flavored pez candy was made availabe here in the states also. 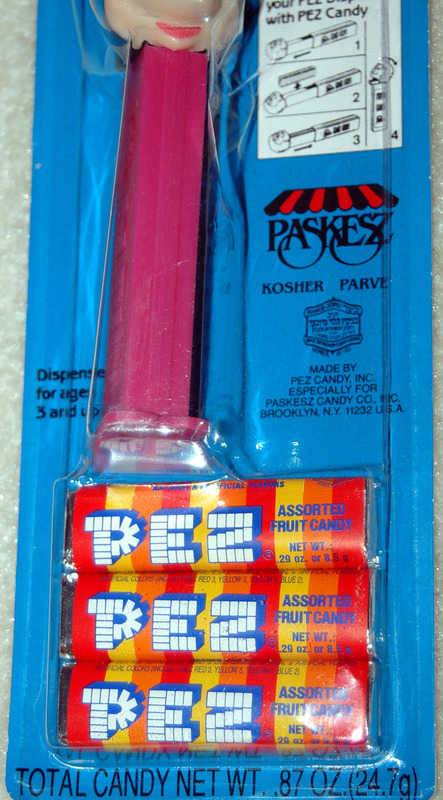 Some U.S. Pez candy flavors are also available in sugar free as well as Kosher (prepared in accordance with Jewish dietary laws) formulations. Rumor has it that a new raspberry flavor will be introduced to the U.S. next year. Along with different flavors of candy, the Pez company developed a large assortment of candy wrappers and packaging. In Europe it became a common practice for Haas to advertise or sponsor other companies and organizations using the Pez candy pack wrapper. Also, especially in Europe , Pez candy was available in a vast array of presentations and could be purchased without the dispenser from vending machines as well as in stores as multi-packs in different package formats (carded, in different sized tins, special holiday boxes, etc.). The older Pez multi-candy packages also often came with premiums such as stickers, rub-on tattoos, clickers or balloons. 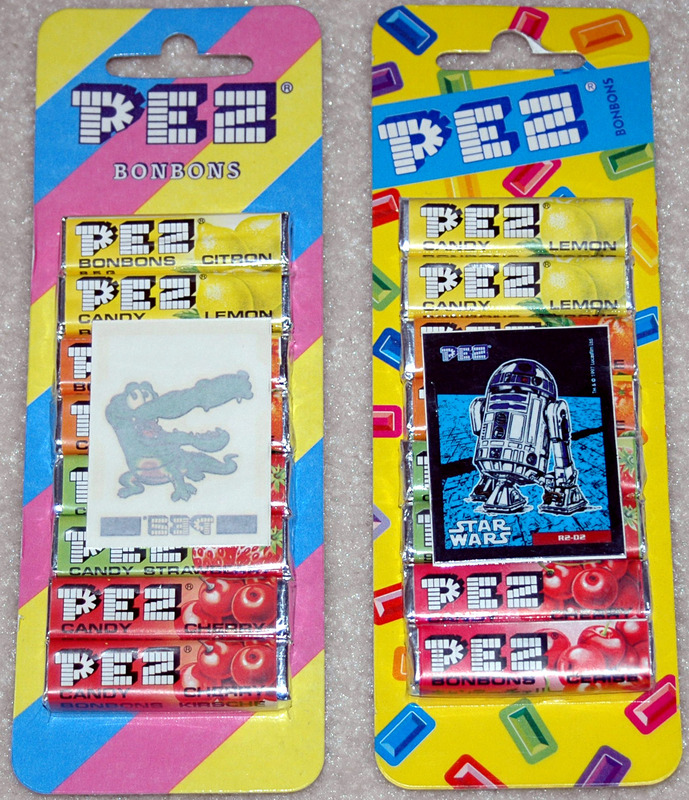 Currently, there are even special Pez candy wrappers available that were made to commemorate the various Pez conventions. Also, some industrious collectors have creatively designed and sell “fantasy” Pez wrappers. Thus not only collecting Pez dispensers but also collecting Pez candy packages can become engaging. 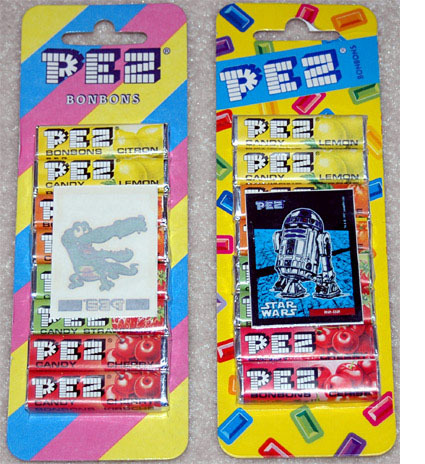 There are many collectors who sub-specialize by acquiring the numerous different Pez candy flavor packs and the large assortment of attractive wrappers and packages produced over the many years that Pez has been sold. If you haven’t already done so, consider adding a little spice to your Pez dispenser collection with colorful and interesting Pez candy pack wrappers and multi-candy packages.